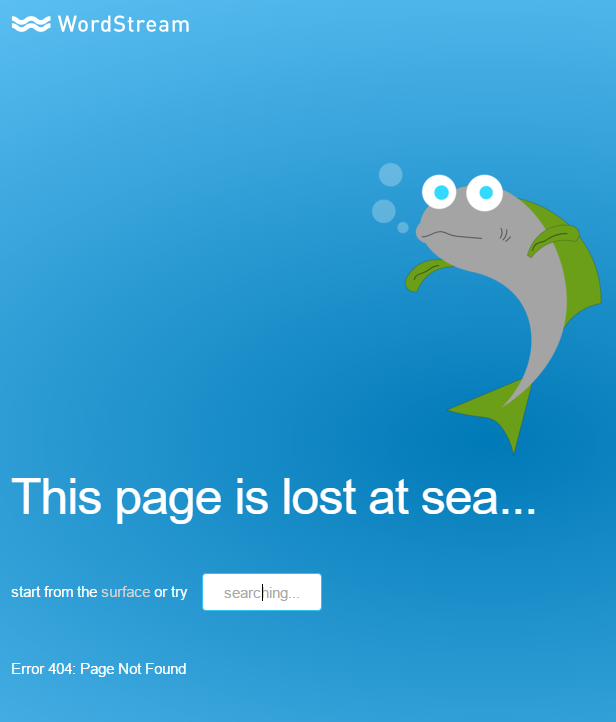 Here at WordStream, our awesome website developer recently redesigned our 404-error page. It seems silly—why spend time on a page that we don’t want people to go to? —but we were all delighted to see the update. It is cute, endearing, and effectively redirects the lost customer to our homepage or the search bar. First things first. 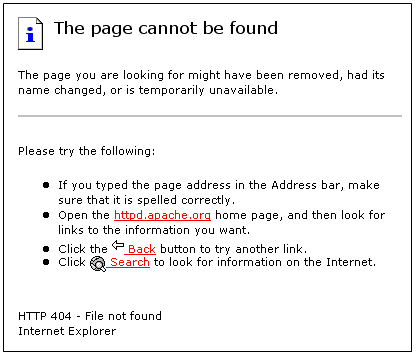 A 404 or Not Found error happens with a user tries to follow a dead, broken, or nonexistent link. Instead of serving the page the user wanted, the site serves the 404-error page. Website designers and marketers are realizing the importance of capturing each visitor to the site, even if they land on an error page. In fact, especially if they land on an error page! You don’t want your visitors abandoning your site for a hiccup that could be your fault for not cleaning up dead links. What Makes a Good 404-Error Page? With the goal of re-capturing those visitors who followed a dead or broken link, your 404-error page should always have a link that redirects the user to the homepage. Bonus points for including category links, a search bar, or a navigation bar, making it easy for them to find what they need. Keep it consistent with the branding on the rest of your website—we use our “WordStream Blue” colors. Remember to be charming! Dad jokes are crowd pleasers. Maybe it really wasn’t your fault that the user ended up on the error page. However, the customer is always right. Here are a few of our favorite 404 pages to land on! This error page feels 3-D; as you move your cursor over the screen, the Star Wars lookalike moves with you! 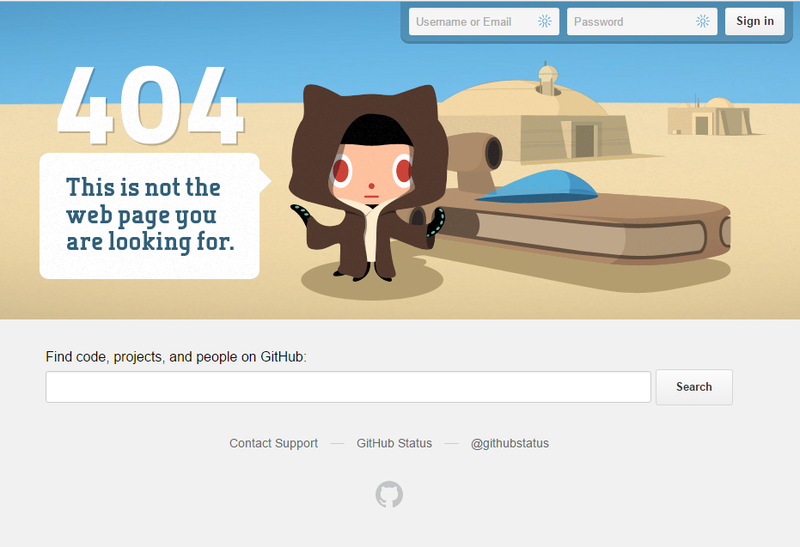 GitHub also provides an easy spot to search the site or login. 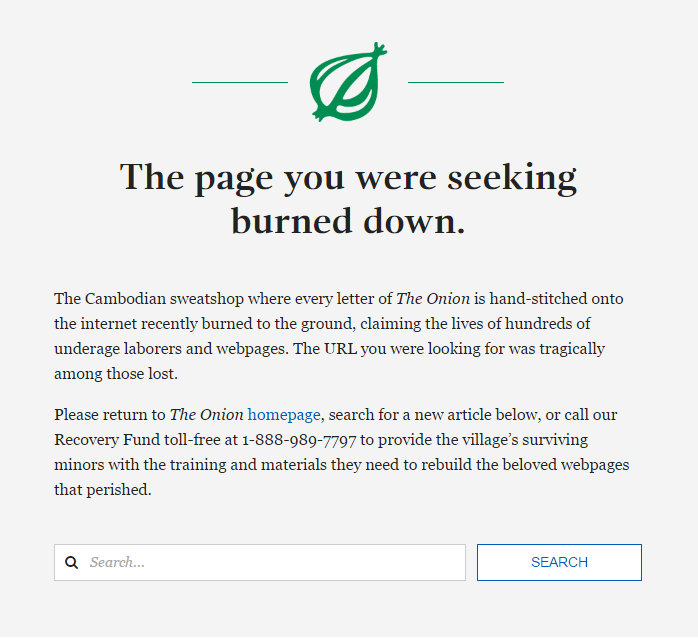 In classic Onion style, this 404 page provides a sarcastic/satirical explanation for how you lost your way, as well as search bar to navigate away. Some developers over at Slack had some fun with this page! 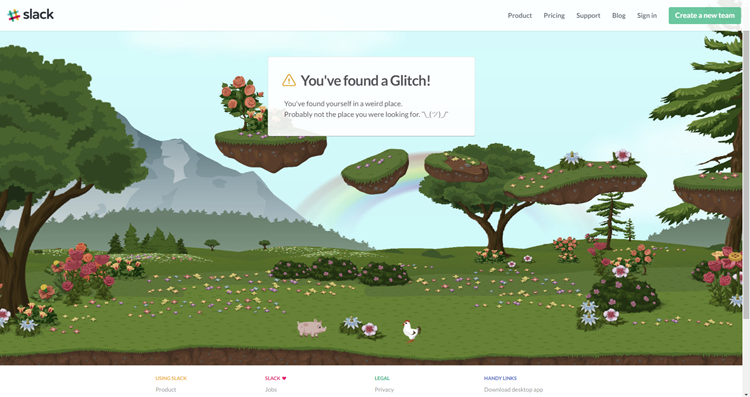 The animation moves through their “weird place”, showing the pig and chicken in various spaces while displaying the top and bottom navigation bars. 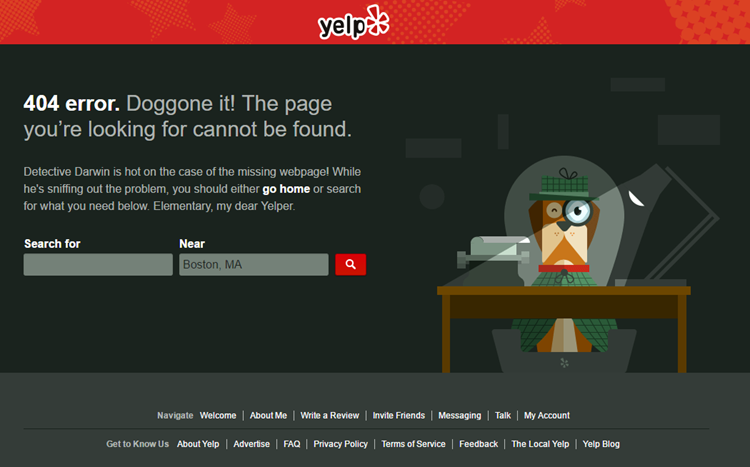 If you like Dad jokes as much as I do, you’ll love Yelp’s error page, featuring Detective Darwin. Per best practices, any Yelper can navigate away from this page easily on the main screen or through the bottom navigation. 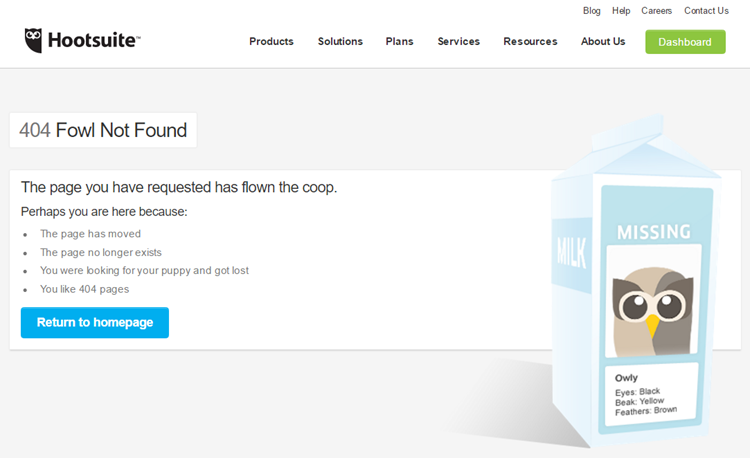 I especially like Hootsuite’s error page because of the very relatable, “Perhaps you are here because: You were looking for your puppy and got lost.” Happens to the best of us. Spotify shows some of the brand’s personality on this page while providing links to get to the previous page, the homepage, and the help page. 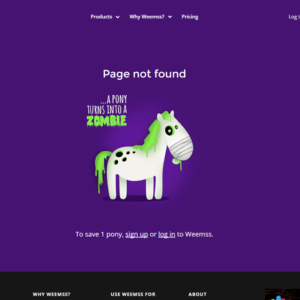 While Larry likes to turn ponies into unicorns, weemss takes a different approach by turning ponies into zombies when you hit their error page! Even better, they offer to help you save a pony…by signing up or logging into their software. 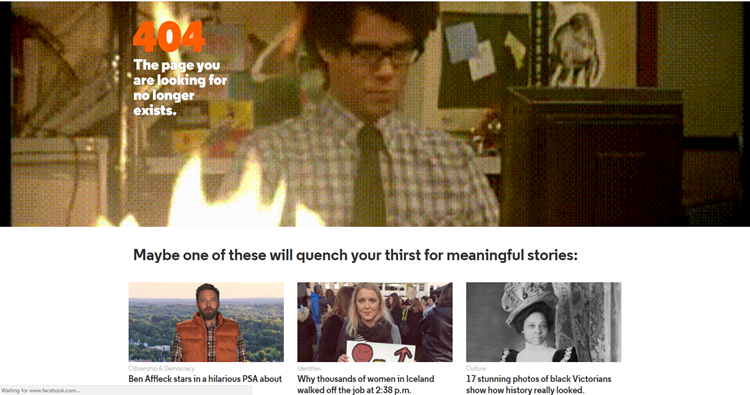 It’s worth a visit to UpWorthy’s error page to see the video that is featured on this page. Although there isn’t the typical search bar or navigation, UpWorthy provides some click-bait instead; which is probably how you got to the website anyway. Saved the best for last! Our website developer recently redesigned this cute page—we’re taking suggestions for fish names. What’s YOUR favorite 404 error page? This article was written by Mary Lister from Business2Community and was legally licensed through the NewsCred publisher network. Previous articleNow THAT’S password security!